My topic this week is condition rarity Washington Quarters that recently realized more than $10,000 each at auction. These are common coins. I am here referring to particular Washington Quarters that are PCGS graded MS-67 or -68. 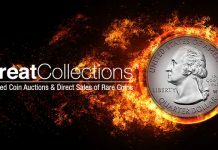 Several leading buyers of these add coins to sets of Washington Quarters that they have registered in competitions sponsored separately by the two leading grading services, the PCGS and the NGC. 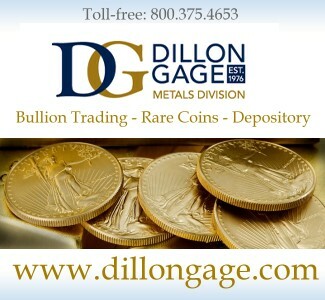 In registry set competition, the relative scarcity of each coin and its certified grade are factors in formulas that determine the respective coin’s contribution in points to the total score for an entire set. In each registry set category, the set that has the highest score is the top ranked and may become the winner for the year. 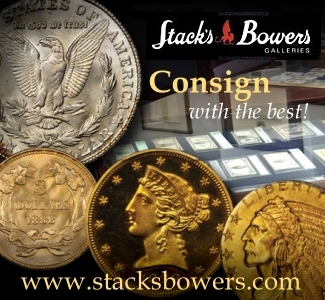 Removing a certified 66 grade coin and replacing it with a certified 67 grade coin of the same issue will often result in a notable increase in the overall score of a particular registry set. Most collectors of Washington Quarters do not participate in set registry competitions. In grades below 65, a set of silver Washington Quarters from 1932 to 1964 is not difficult to assemble and is not expensive. The 1932-S and the 1932-D are relatively expensive in all grades. These are often priced around $75 each in Good grades. The auction record for a Washington Quarter is the $143,750 price that was paid for the only PCGS graded MS-66 1932-D on April 15, 2008. Charlie Browne was the successful bidder. 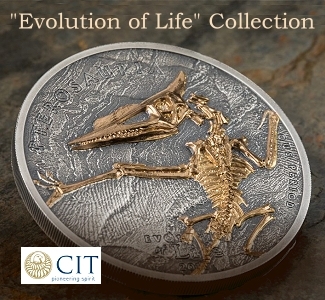 Browne has been a leading grading expert for decades, and is currently a grader for the PCGS. The 1932-D and the 1932-S are the two key dates in this series, though these are not really rare overall. As no 1932-D or 1932-S Washington Quarters have been PCGS certified as grading MS-67 or higher, and these are relatively scarce, these two issues are beside my overall point regarding five figure sums paid for extremely common coins. 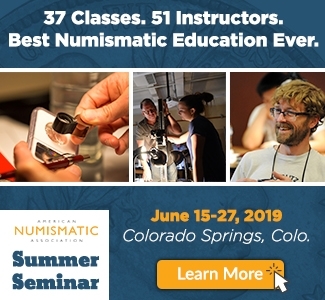 The topic here relates to people paying more than $10,000 each for 20th century coin issues, of which tens of thousands or even millions exist. Washington Quarters that are 90% silver were minted for circulation from 1932 to 1964. Some ‘1976’-S business strike, Bicentennial quarters were struck in a silver alloy, as were some Proofs. These are a different topic. Since 1992, silver Proof Washington Quarters have been struck to be marketed to collectors, and these constitute a separate topic as well. Washington Quarters dated from 1965 to the present, which were intended for circulation, are made of a copper-nickel “Clad” alloy. All Washington Quarters are widely collected. Really, after Lincoln Cents, Washington Quarters are probably collected by more people than any other type of coins. The popularity of Washington Quarters surpassed that of Jefferson Nickels after the beginning of the State Quarter Program in 1999. Though a portrait of George Washington remained on the obverse (front of each coin), fifty separate State Quarter issues were introduced over time from 1998 to 2008, each with a distinctive reverse (back) design. State Quarters have been followed by Washington Quarter issues relating to U.S. territories in 2009 and to national parks since 2010. Each such issue has a standard Washington obverse design paired with a reverse devoted to a territory or a park. It is not difficult to complete a set of State Quarters from change. 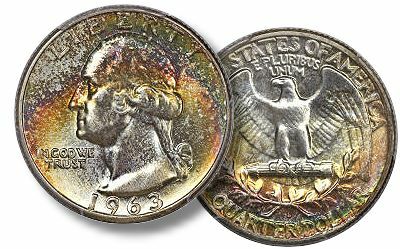 Many collectors who began by collecting ‘Clad’ State Quarters in change later decided to pay premiums for silver Quarters that were minted from 1932 to 1964. After all, for a collector with a modest budget, it is easy to complete a set of all Washington Quarter issues from 1932 to the present. Collectors like to complete sets. Once a collector gets started with one type of coins, there is a strong temptation to collect all issues of that design type. Hence, Washington Quarters in general have become extremely popular. In regards to Washington Quarters, it would be very unusual for Proofs to be confused with business strikes. High grade business strikes tend to have luster, metal flow lines that reflect light, while Proofs tend to have mirror surfaces. Proof Washington Quarters are each struck more than once and typically exhibit more detail than corresponding business strikes. By tradition, coins are graded on a scale from zero seventy. 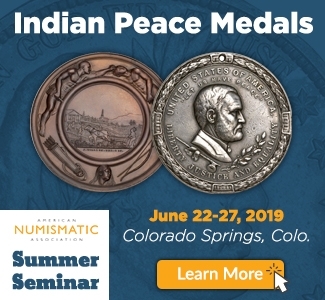 Generally, coins that grade below sixty have readily apparent wear, while business strikes that grade from sixty to seventy are said to be ‘Mint State’ (MS). 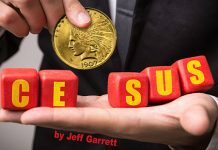 The term ‘uncirculated’ is nearly synonymous with ‘Mint State.’ For the present discussion, the concepts of ‘MS’ and uncirculated may be thought of as being the same. Good condition coins grade from 04 to 06. The numbers 08 and 10 refer to Very Good grades, and 12 or 15 grade coins are in ‘Fine’ condition. There is a range of grades that fall into the category of Very Fine. Extremely Fine grade coins, sometimes awkwardly called Extra Fine (XF), range from 40 to 45+ on this scale. 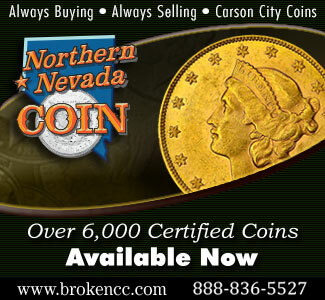 Almost Uncirculated coins may be rated 50, 53, 55 or 58, and plus signs are sometimes used. 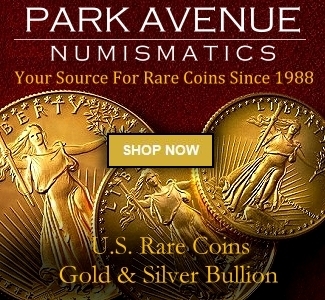 A coin is a condition rarity if it is common below grade X and extremely rare above grade X. A condition rarity is not rare in absolute terms, more than 500, or even more than five hundred thousand, exist; yet, fewer than one hundred, or maybe even fewer than five, are known to grade above a certain level. There are only two 1943 Philadelphia Mint quarters that are PCGS graded MS-68. In the Heritage ‘Central States’ auction in April 2012, one of the two sold for $23,000. It was part of the “George’s Army Collection,” as were all the specific quarters that I focus upon here. It is now in a PCGS Registry Set that is cloaked, that is its contents are not currently revealed. Plus, the owner wishes to remain anonymous. Probably, the owner of this PCGS registry set purchased the ‘George’s Army’ 1943 quarter from this auction, either directly or through an agent. 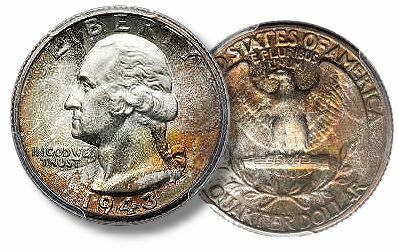 In MS-61 grade, a not certified 1943 quarter is worth less than $8. Even in MS-63 grade, one could probably be found for $12. The Numismedia.com retail value for an MS-64 grade 1943 quarter is “$22.50,” less than one thousandth of the price of this 1943 quarter. During the same week in Illinois in April, Heritage auctioned two PCGS graded MS-67 1943 quarters, one for $299 and the other for $632.50. I wish that I had seen them. I am curious as to how these two differ. Each is CAC approved. In any event, the PCGS has graded sixty-nine as MS-67, a number that probably amounts to forty to fifty different 1943 quarters. More than ninety nine million 1943 quarters were minted in Philadelphia. There must be more than five million around, including hundreds of uncirculated rolls that have never been examined by expert graders. The prices realized for two Denver Mint issues from the 1960s really captured my attention. As the use of silver in quarters for circulation was formally ended in 1965, and the hobby of collecting coins at face value was booming in the early to mid 1960s, I am certain that many millions of 1962-D and 1963-D quarters were saved. The “George’s Army” 1962-D sold for $18,400. Dave Schweitz found this price to be “quite strong.” Schweitz is an expert in gem quality Washington Quarters. I believe that the “George’s Army” 1962-D is now in the second ranked PCGS registry set in the category of “Washington Quarters, Basic Set … 1932-1964.” It is one of only two 1962-D quarters that are each PCGS graded MS-67. More than one hundred different 1962-D quarters have been PCGS graded as MS-66. For a MS-65 grade 1962-D, it would not be cost-effective to pay a grading fee. Maybe a PCGS graded MS-65 1962-D quarter is worth $20 and a raw one is worth $10. The mintage is more than 125 million and I would not be surprised if twenty million survive. I am almost certain that there are thousands of rolls of uncirculated 1962-D quarters sitting in bank vaults or home safes. These are owned by people who forgot that they have them or, frequently, by people who figure that these quarters are worth only their bullion value. There are probably even more 1963-D quarters than 1962-D quarters in existence now. The “George’s Army” 1963-D is one of four that is PCGS graded MS-67. As a MS-67 grade ‘condition rarity,’ it is thus half as rare as the 1962-D. The original mintage of the 1963-D is even greater than that of the 1962-D, more than 135 million. Probably more than thirty million survive. Many thousands would be PCGS graded MS-65 if it was cost-effective to submit them. George’s 1963-D realized $16,100 in April. Heritage auctioned this exact same coin for $8625 in Dec. 2008, and for $6900 in April 2006. 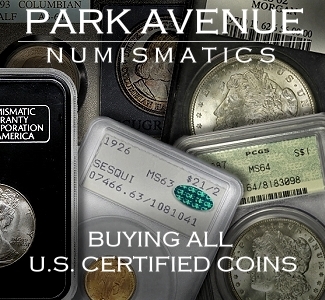 It is noteworthy that there were four that were PCGS graded MS-67 prior to April 2006. It thus seems that not one 1963-D has been upgraded to MS-67 during the past six years. I have never seen this coin, though I wish that I had. In images, this coin’s toning appears to be really cool. 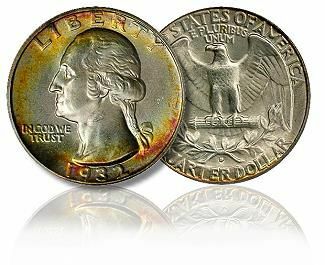 The aesthetics of this 1963-D quarter may have spurred bidders to rise to levels that would have been unthinkable in the past. 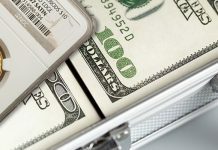 There is a good chance, though, that the successful bidder and the underbidder both felt compelled to seek it for their respective registry sets. I am under the impression that it is now in one of the two cloaked sets among the top five in the “Washington Quarters, Basic Set … 1932-1964” category. V. $17,250 for a 1959! I cannot resist mentioning the price realized for the “George’s Army,” Philadelphia Mint 1959 quarter. After all, I was stunned to learn of the $17,250 result. It is one of three 1959 quarters that are each PCGS graded MS-67. Even so, the PCGS has graded 600 as MS-66 and two as MS-66+, plus 775 so far as MS-65. In a recent Internet-only sale, Heritage sold a PCGS graded MS-66 1959, for $59. 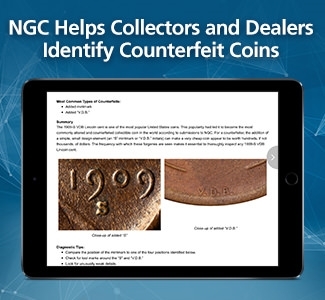 Other than mint errors, the previous Heritage auction record for a 1959 quarter was $603.75 for one that is NGC graded MS-67 and was auctioned in 2004. Curiously, the 1959 has a much lower mintage than most of the other Washington Quarters that I have mentioned, less than twenty-five million! I suggest that four million survive. While I never saw the ‘George’s Army’ 1959, images suggest that it may possibly be a coin of amazing quality, beyond that of most PCGS graded MS-67 silver Washington Quarters. Schweitz reports that he “did really like the 1959-P, but was outbid by a collector that had to have the coin.” It is now in a PCGS registry set. The ‘George’s Army’ 1932 Philadelphia Mint quarter realized $40,250 in April. This exact same coin was auctioned for $21,850 by Spectrum-B&M on April 15, 2008, when demand for gem quality Washington Quarters was greater than such demand is now. In my view, the $40,250 result is extremely strong. Yes, it is one of only two that are each PCGS graded MS-67. Both of these are in PCGS registry sets. The PCGS has graded more than one-hundred-sixty as MS-66, two so far as “66+”, around five hundred as MS-65, and more than one thousand as MS-64. 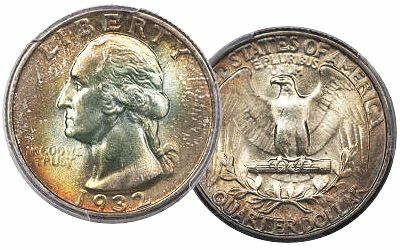 In MS-60 grade, a 1932 quarter is worth around $21. A PCGS graded MS-65 1932 could probably be acquired for around $525. More than five million were minted. As 1932 was the first year of issue of a new design type, and this first issue attracted attention as commemorating the two hundredth anniversary of Washington’s birth, many were saved in 1932. Others were pulled from change as decades passed. More than seven hundred thousand probably exist now. I have seen the coin. While it has really neat natural toning, there are plenty of contact marks underneath the toning, some in prime focal areas. I could not bring myself to grade it as MS-67. Rather than acquiring a 1932 quarter, in my opinion, $40,250 could be better spent on rare 19th century quarters. For this sum, several truly rare and really neat Bust or Liberty Seated Quarters could be obtained, though not in MS-67 grade. By ‘truly rare,’ I mean coins for which fewer than five hundred exist in all grades. 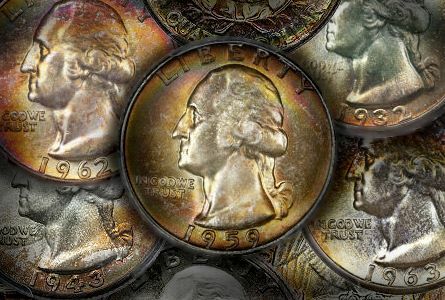 The notion of spending thousands of dollars on condition rarities of coin issues that are very common overall is not new. This notion predates the introduction of registry sets. More than twenty years ago, I was stunned when several collectors of gem quality, early Lincoln Cents began paying many thousands of dollars each for more than a dozen different dates in the Lincoln Cent series. Furthermore, I remember a Proof Barber Dime, which was not a rare date, selling at auction for around $15,000 in the pre-registry era. Additionally, two different, typical date, Proof Morgan Dollars each sold privately for more than $100,000 each in 1992 or 1993. Also, certified MS-67 to MS-69 grade common, business strike Morgans sold for staggering amounts years before registry sets were introduced. 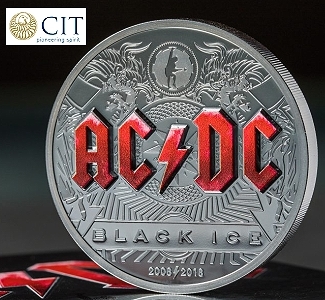 It is true, of course, that registry set competitions have spurred the practice of paying tremendous premiums for coins that are among the highest certified for their respective issues. It is also true that the registry set phenomenon has triggered demand for post-1934 condition rarities. In the pre-registry era, the condition rarities that brought megabucks were usually, though not always, dated before 1934.
Business strike U.S. coins minted after 1934 tend to be extremely common. Grade-inflation has occurred over the past twenty years, especially from 1997 to 2006. 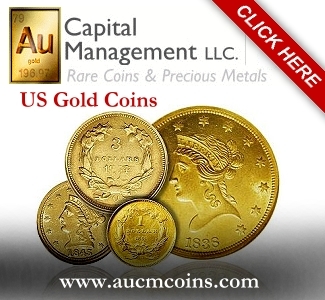 If most experts regard a particular certified coin as being overgraded, they will not usually reveal their respective opinions. 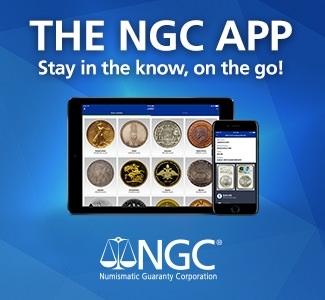 While it makes logical sense for all coins valued above $250 to be PCGS or NGC certified, it does not make sense to assume that every PCGS or NGC certified coin is fairly graded in the opinions of most experts. 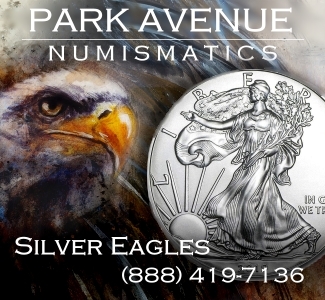 Silver coins may legitimately increase in grade over time. A MS-65 grade silver coin that is properly stored in an album, of a format that has traditionally been used by many coin collectors, may beautifully tone over a period of five to thirty years. A lifeless coin may become awestriking, though this will not typically occur. For the issues that I have mentioned, other quarters may eventually rise to MS-67 or -68 grade levels. Indeed, when contact marks are covered by very attractive, natural toning, the same contact marks have less negative impact on grades than they would if the same respective coins were not toned. 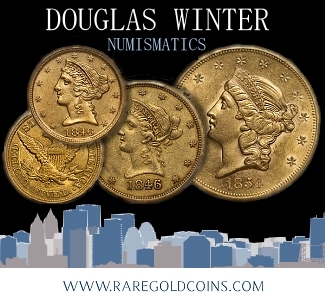 In the culture of coin collecting, rare coins have always been considered more important than closely related or analogous common coins. In a sense, condition rarities have always been demanded. 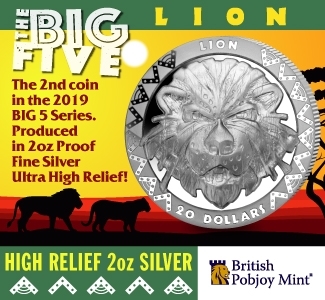 Sophisticated collectors, however, tend towards condition rarities of coins that are mildly rare or at least scarce overall, and usually avoid condition rarities of coin issues that are extremely common. Also, if a coin is common in Good-04 to Fine-15 grades and scarce in higher grades, a MS-67 grade representative has more meaning to a sophisticated collector than a MS-67 grade coin does for a coin issue that is common in MS-65 grade. I honestly maintain that the simplistic and critical comments by Morgan and Golino are insulting and without merit. The concepts of popularity, aesthetic appeal, overall rarity, condition rarity, and key dates versus common dates, are all incorporated into the above article. 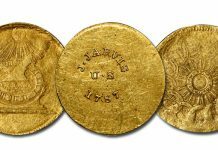 With the exception of a few cataloguers of auction lots, I have written more about the physical and aesthetic characteristics of specific U.S. coins than anyone else in the history of coin collecting. As the only certified MS-68 coin mentioned in the above article is the ‘George’s Army’ 1943 that sold for $23,000, I assume that Charles is referring indirectly to it. I really thought my discussion above was clear. A MS-64 grade 1943 quarter is fairly valued by Numismedia.com at $22.50. 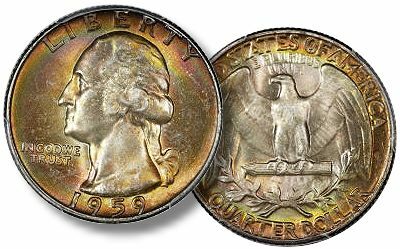 During the same week that Heritage auctioned this certified MS-68 1943 quarter, Heritage sold two that are PCGS graded MS-67, one for $299 and the other for $632.50. Whether this certified MS-68 coin should be worth such a premium over one that is certified by the same service as MS-67 is a fair question. Besides, Charles Morgan does not seem to think that my point that more than five million 1943 quarters exist in all grades is especially significant. I am offended that Charles is suggesting that I am not knowledgeable about silver quarters. Please read some of the many articles that I have written about them, including several recently here on CoinWeek.com. 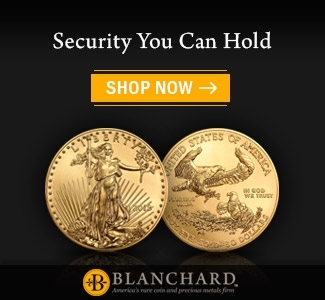 Obviously, I never said that people should focus exclusively on a coin’s certified grade. 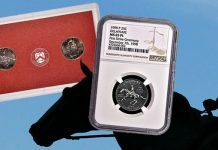 Indeed, it is apparent in the above article that I do not think that it is a good idea for a collector to acquire a coin solely because it is certified as grading MS-67 or -68. I never said that “it was all about rarity,” nor did I ever imply that rarity is the only factor to be taken into consideration when evaluating a coin. The second part of this statement is wrong and indicates a mis-understanding of markets for vintage commemoratives. Collectors often choose fifty piece type sets of vintage commemoratives OR 144 piece ‘date’ sets. For every person who seeks all 144, there are at least fifty buyers who collect fifty type coins. There is just one variety of business strike Hawaiian Commemorative Half Dollars, while Arkansas Commemorative Half Dollars were minted for five years at three different mints. The relevant comparison here is between a Hawaiian Commemorative Half and ANY Arkansas Commemorative Half Dollar, not necessarily a 1939 Philadelphia Mint issue. Hawaiian Halves are relatively scarce, fewer than 10,000 exist, while Arkansas Commemoratives in total are relatively common. Far more than 40,000 Arkansas Halves of all dates survive. Charles is wrong. It is primarily because of relative rarity that a Hawaiian Commemorative is worth more than any single Arkansas Commemorative, assuming that the quality of the coins is the same. Someone who reads carefully and thoughtfully would realize that, in the above article, I am, for the most part, comparing silver Washington Quarters of the same date in different grades. My points in the article above are not relevant to half dimes or to 1916-D dimes. Besides, 1916-D dimes are KEY dates. 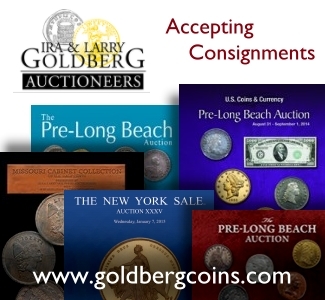 I make clear in my article above that I am referring to recent auction results for common date Washington Quarters, extremely common dates, NOT key dates. There are more 1959, 1962-D and 1963-D quarters in existence than there are people who collect them. This is obviously not true of 1916-D dimes or of 1909-S VDB cents. 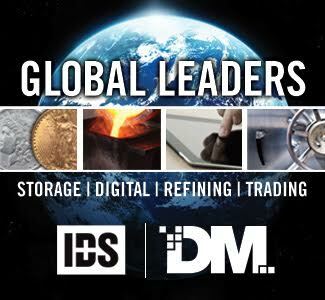 Hopefully, Charles and Louis are aware that the 1909-S VDB Lincoln Cent and the 1916-D Mercury Dime are key dates in their respective series and they are much, much less common than the 1932, 1943, 1959, 1962-D and 1963-D quarters that I focus upon in the article above. There are maybe around fifty thousand 1909-S VDB Lincoln Cents in existence, perhaps ten thousand 1916-D dimes, and probably more than thirty million 1963-D quarters. In other contexts, this point would be valid and educational. As a comment on my article above, it is insulting and misleading. After all , I did discuss the popularity of Washington Quarters. I indicated a connection between popularity and demand. It should be clear that there could not be more than thirty million people collecting silver Washington Quarters ‘by date’ (including mintmarks) . There are probably three million coin collectors in the United States, some of whom are not interested in Washington Quarters. Yet, it is likely that there currently exist more than thirty million 1963-D quarters and more than five million each of many other dates in the series of silver Washington Quarters. For Charles or Louis to fairly challenge my points, it is necessary to first read my article above, in its entirety. Please consider an added point. A PCGS graded MS-67FB 1916-D is worth maybe four times as much as a PCGS graded MS-65FB 1916-D dime. As I said above, a PCGS graded MS-67 1962-D quarter recently sold for $18,400, while a PCGS graded MS-65 1962-D quarter would be worth maybe $20. A ratio of 4:1 is much different from a ratio of 920:1. This comparison of ratios of the prices of MS-67 to MS-65 grade pieces is separate from my estimates that there are maybe ten thousand 1916-D dimes in total and probably more than twenty million 1962-D quarters surviving. It is important to consider both such factors when spending substantial sums for MS-67 grade coins. Of course, the physical characteristics and overall appeal of individual coins are very important, too. I think sometimes, and I grant you that I read your entire article and it is not that you don’t make sound arguments, but, sometimes you lose track to the fact that people are buying coins and not numbers. An MS-68 coin with a mintage of 10 or 20 million coins may sound like one piece amongst a legion of other similar pieces- but this is not always the case for knoweldgeable specialist type collectors. Sometimes the coveting of a coin weighs into the price as much as the number on the slab. If it was all about rarity then 1939 Arkansas half dollars would be worth more than the coveted Hawaiian. Or the lowly Seated Liberty half dime proofs would be worth more than the 1916-D dime. Supply and demand is at work with these auctions. One coin verses more than one bidder. 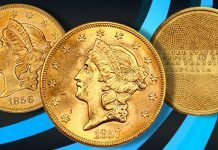 I agree with Charles Morgan that one has to consider demand and popularity, and that sometimes a widely collected coin can be worth more than one that is technically rarer. There was an article somewhere recently that made this point using the 1909-S VDB penny compared to a rarer coin. But still I think the author of this article is making a different and also important point, which is that one should be careful about paying large sums for modern condition rarities whose prices may be driven artificially high by registry sets. I want to know why are all the 1932 Washington quarters p. have rubbed down fields. What are they trying to remove maybe the Masonic symbols all over the quarter. I know I have one that is origunal. You can buy it if you want its on coinbook.